You just got braces at Banasiak & Nettune Orthodontics Associates and the orthodontist has informed you that over the next several months you will want to avoid eating anything sticky, hard, crunchy, or chewy. What does this leave for you to eat? Lettuce? Nothing? We found some great recipes in the book, “The Braces Cookbook: Recipes you (and your Orthodontist) will Love,” which gives patients a variety of delicious recipes, that are safe to eat with braces. Here is a recipe from the book that is sure to keep you satisfied this Winter Season. Preheat your waffle iron according to the directions. You may want to lightly spray it with vegetable oil before heating. In a large bowl, whisk (or use electric mixer on low) together all ingredients. Let batter sit for about five minutes to activate the baking powder. When waffle iron is ready, pour about 1/3 cup of batter onto each of the four squares (experiment with your iron – you don’t want the batter overflowing). Gently close the cover and set your timer as the manufacturer suggests. Do not lift the cover while they bake. When done, carefully lift one edge with a flat spatula and pull the waffle away from the iron. 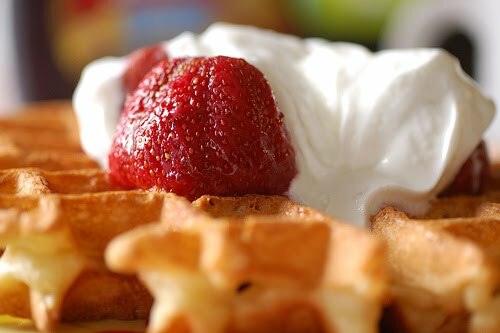 Keep waffles warm on a plate under a clean dishtowel while the others bake.